Since the 1960's, NASA has supported and funded some of the basic scientific research that has attempted to understand how the sense of balance (vestibular system) operates and how it affects brain processing and sensory integration. This research has changed our understanding of how the brain works. 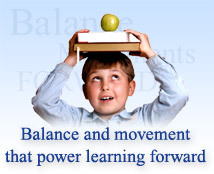 It has shown that activities that involve balance can have a significant effect on visual processing, reading, and learning efficiency and academic performance. When a person views an object through a prism the object appears to shift its position in space. This is because the rays of light that bring the object into the visual field are bent as they pass through the prism. The result is that the object appears to be in a different spot than it actually is. The object doesn't really move, it only appears to move. This experiment demonstrates one of the fundamentals of visual processing. What we see is sensed by the eye, processed by the brain, and projected into space. The accuracy of our visual perception, the extent to which it matches reality, is dependent not only upon the acuity of our vision, but also on the efficiency of the brain processes that created the images we see. It is important to understand that vision is a brain process of which the eyes are only one component. The objects and images we see in the space around us are created in the brain using a complex system of neural networks. Neural networks are the mechanism the brain uses to process information. They are made up of many neurons within the brain that transmit information by emitting small electrical impulses. As we look at an object, the brain uses the information gathered by our eyes to begin the visual process. The objects that we see with our eyes are only a part of the information our brains use to duplicate the images in our brain and give them meaning. Data stored in the motion processing and memory systems of our brains provides a large part of the information our brain uses to create the images we see. The system that the brain uses to project the images we see as well as determine the motion of the object in the space around us is based upon an inertial gravitational process. That is to say that the brain goes through a complex series of events as it processes the information we see and uses the force of gravity to make those determinations. It can best be explained using the following analogy. As a quarterback, in the game of football, receives the ball from the center and drops back to pass, his brain must begin to process and plan a complex series of events. The quarterback must locate the receiver and determine the receiver's rate and direction of motion. He must plan a trajectory for the football, an intercept point for the ball and the receiver, and the amount of energy he needs to impart to the ball. He must maintain a high degree of balance throughout the throwing motion. In order to do this, his brain must compute a counter-balancing movement in order to compensate for the missile launching or throwing motion. All of these calculations must be completed by the brain prior to any action taking place. This is not only a visual process. His ability to execute such a complex series of actions depends on many different brain processes which have been developed over many years and which must work together effectively in order for the pass to be completed. As the act of passing the ball is executed, the vestibular system (sense of balance), the visual, auditory, and motor systems, as well as many other systems in the brain which are not directly linked to the main special sense organs (eyes, ears, etc), begin the process of evaluating the result of the throwing action compared to the plan. The brain then goes through a process of recalibrating itself. It stores the information gained from the event for future planning. There are four distinct phases in this sequence of events: planning, executing, evaluating, and recalibrating for future use. In the example, the quarterback had to overcome inertial and gravitational elements in order to be successful. The visual and auditory projection of objects out into space requires the brain to overcome the same inertial and gravitational elements that the quarterback had to overcome. In order for the brain to overcome the inertial and gravitational problems that it encounters in a variety of different activities, it relies on the vestibular system (balance sense) located in the inner ear. The vestibular system is the primary inertial and gravitational sense. It is able to sense linear and angular accelerations or movements of the head. It accomplishes this by using information received from two separate motion sensors in the inner ear, the semicircular canals and the otoliths, as well as other sensory systems. The semicircular canals can sense angular or rotational movement in three dimensions while the otolith organs sense transient linear movement in any direction as well as changes in tilt (orientation relative to gravity). The first sensory system to develop and provide the brain with meaningful information is the vestibular system or balance sense. Soon after conception, the human brain begins developing an intelligent response to its environment by utilizing its ability to sense three-dimensional movement and reference it to the force of gravity. The ability for an individual to perform motor actions, control various parts of the body in space, and project objects into visual and auditory space is possible because of the ability of the vestibular system to overcome the inertial and gravitational problems encountered in these types of activities. The motor system and other brain systems that control body, limb, finger, tongue, lip, jaw, and eye position, and which are responsible for gross and fine motor skill, also sense movement and position in space utilizing gravitational and inertial information. These senses, as well as the auditory and visual systems, are built on, integrated with, and highly dependent upon the inertial and gravitational foundations provided by the vestibular system. The three dimensional referencing system provided by the vestibular system allows our brain to develop structures to create language, to think and create linguistically, and to read and write. The coordination of all of the brain's timing processes is probably dependent upon and referenced to inertial gravitational information provided by the vestibular system. In order for the brain to successfully integrate it's many senses and systems it must depend on a stable, highly evolved coordinating mechanism. It is most likely that the mechanism the brain uses to accomplish this task relies heavily upon the information provided by the inner ear with regard to the acceleration of gravity. The brain's ability, or inability, to achieve the necessary resolution required in this process determines the resolution and efficiency of all other brain processes. The resolution of this calibration is also relative to the resolution of an individual's balance. To put it simply, the individual's ability to balance is indicative of the efficiency of his or her brain processes. The brain is not a static system. It changes over time and is subject to manipulation depending on the inputs it receives. As we already know, every act of the human brain involves a recalibration component. In order to recalibrate an instrument one must have a reliable standard of reference. The acceleration of gravity is the standard of reference for the brain as it uses information provided by the visual, auditory, motor, and secondary systems to perform the complex operations required in reading, writing, playing music, athletics, etc. In short, a person's ability to learn is dependent upon their ability to process information effectively. Many people who have a learning disability have poor brain processing ability. The brain's inability to process information from the various senses efficiently is commonly called sensory integration disorder. When a person engages in balance exercises that includes motor activities involving many different sensory systems, the brain utilizes neural networks to organize and execute the activities effectively. As the difficulty of a task increases, the number of neurons the network requires to perform the task increases. This truth is demonstrated in the following example. If a person throws a ball to a small target at four meters distance, the release window for the ball leaving the hand is eleven one thousandths of a second. If the same target is moved to eight meters distance, the release window decreases to ¼ of one thousandth of a second. The brain requires 64 times as many neurons to fire at precisely the right time to hit the target at eight meters as it does at four meters. We understand that the complexity of the task dictates the level of neural involvement required. Balance activities that incorporate increasing levels of difficulty on the Belgau Balance Board have the effect of constantly building and creating more extensive neural networks. Because the neural networks that are created in this process are the same ones that are responsible for the resolution and efficiency of the brain's visual, auditory, motor, and sensory processes, balance activities improve the efficiency of the brain. We have the ability to learn because of the existence of these many brain systems. It follows that the ability to learn is relative to the resolution and efficiency of these systems.